Specialist belt supplier, Rydell Industrial (Belting) Co are now able to supply the comprehensive full range of Gates agricultural belts. These agricultural belts work in the heavy conditions that agricultural machinery does; outdoors and often in constant sunlight and hot conditions. 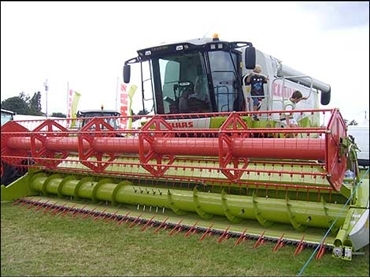 Combine harvesters and tractors also use relatively small tensioners, which implies a significant additional load on the belt in terms of deformation and temperature increase. Furthermore, belts in this kind of agricultural machinery are subjected to dust, dirt, stones and other objects that may enter between the belt and the pulley. For all these reasons, it is important to only use belts specially designed for use in agricultural applications, as these agricultural belts are built to specifications capable of withstanding such hash conditions. Rydell Industrial (Belting) Co and Gates offer the market a high quality range of replacement agricultural belts for heavy duty power transmission applications. They are specially developed for heavy duty drives on farming machinery. Gates agricultural belts are available as wrapped V-belts with concave sidewalls and FlexWeave band, and as raw edge, cogged V-belts with special cog design. multilayer elastomeric building process, with oriented fibres in the undercord, resulting in a better cord support.